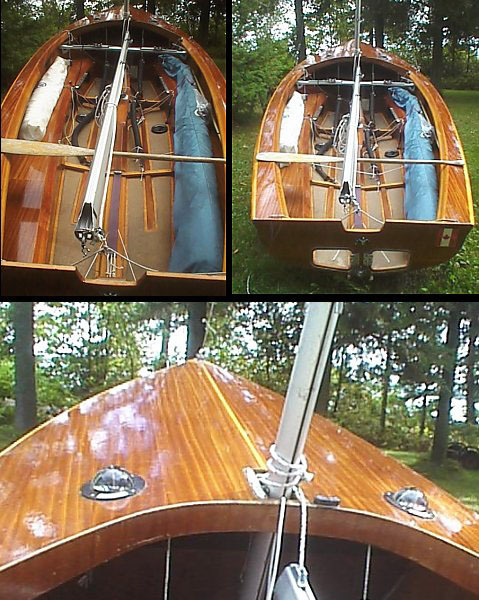 Woof built about 150 Albacores using three layer cold molded plywood hull and plywood deck and centerboard case. Full length seat tanks sealed to serve as flotation. Separate bow tank of relatively small volume. Centerboard case width near class allowable maximum of 30mm. Well shaped contoured side decks make for comfortable hiking. Approximately 15 Woof's have been imported to North America as of 2004. Forward end of seat tanks angled aft towards the boat's centerline. No floor stiffening. Aft swept thwart overlapping onto seat tanks. Forward end of seat tanks angled forward towards the boat's centerline, longitudinal and athwartships stiffening in the floor. Thwart at right angles to centerline and butting into the inboard side of seat tanks. Forward end of seat tanks tie into open bulkhead connecting chain plates, deck, and hull to centerline. No thwart, only angle bracket structure connected between the confluence of the seat tank and floor and the top of the centerboard cap. Longitudinal and athwartship stiffening in floor.